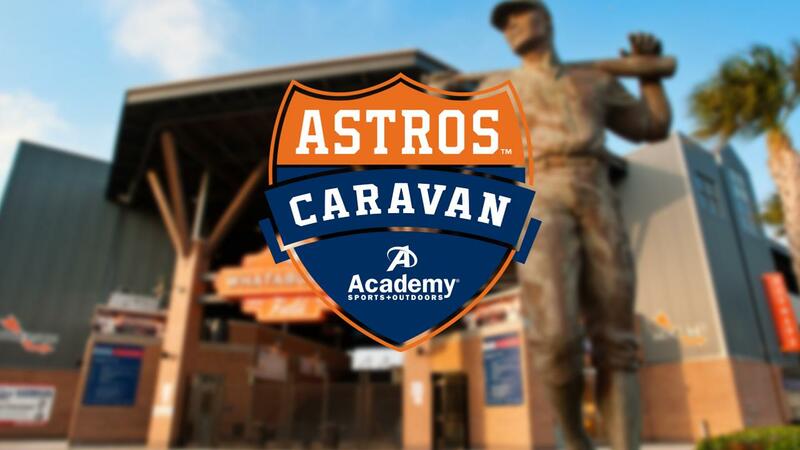 CORPUS CHRISTI - Catcher Max Stassi, outfielder Myles Straw, and right-handed pitcher Corbin Martin return to the Sparkling City on Wednesday, January 23, for the 2019 Houston Astros Caravan, presented by Academy Sports + Outdoors. Whataburger Field is the site of the Caravan Jam, which runs from 5 to 7 p.m. This free event features a live DJ, inflatables, food, games, and more. Joined by Astros broadcaster Robert Ford, Stassi, Straw, and Martin will participate in a question-and-answer session as part of the festivities. Hooks Season Members enjoy access to an exclusive meet-and-greet and photo opportunity. January 23 is also Select-A-Seat Night at Whataburger Field, with team representatives accommodating those interested in becoming Hooks Season Members. Prior to arriving at Whataburger Field, the Astros Caravan will stop at an area Whataburger from 2:30 to 3:30 p.m. Location to be announced. Please note this is not an autograph session. RSVP at our Facebook event page for live updates on the caravan. Call 361-561-HOOK or Click Here for more information on Hooks Season Memberships.